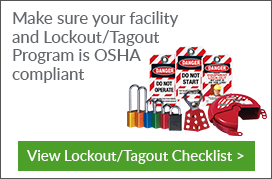 Lockout devices are an important factor in complying with federal lockout/tagout regulations. These regulations highlight the employer's responsibility to protect workers from hazardous energy sources, with managers encouraged to develop safety programs that are best suited to their facility. This means that employers are allowed a variety of lockout/tagout (LOTO) devices to use. As a leader in workplace safety, Seton offers customers a wide range of lockout devices to choose from. Using the proper LOTO devices helps ensure that machines and equipment are secure and kept within regulation compliance. Gate Valve Lock-Outs block access to valve handles. Red plastic gate fits valve handle 5" to 6-1/2". The Occupational Safety and Health Administration (OSHA) has three particular requirements for setting up lockout tagout processes. These requirements are training, procedure documents, and inspections. Regarding training, regulations specify two types of people who should receive training: authorized and affected employees. Authorized employees are workers tasked with maintenance and/or servicing work. These are also the employees who are directly responsible for lock-out tag-out. Affected employees, meanwhile, are those work with or near equipment undergoing lockout/tagout (LOTO) routines. In both instances, lockout training will depend on the proper allocation of time and resources. And for workplace safety, the time and effort going to such programs are more than worth it.